On an outing to Forks of the Credit Provincial Park, Bob and I were winding down our day after having spent several hours on the beautiful trails there. As we strode across Kettle Trail to regain the Trans Canada Trail and then the parking lot, an unfamiliar sound met our ears. We soon spotted the source in a treetop not far away. 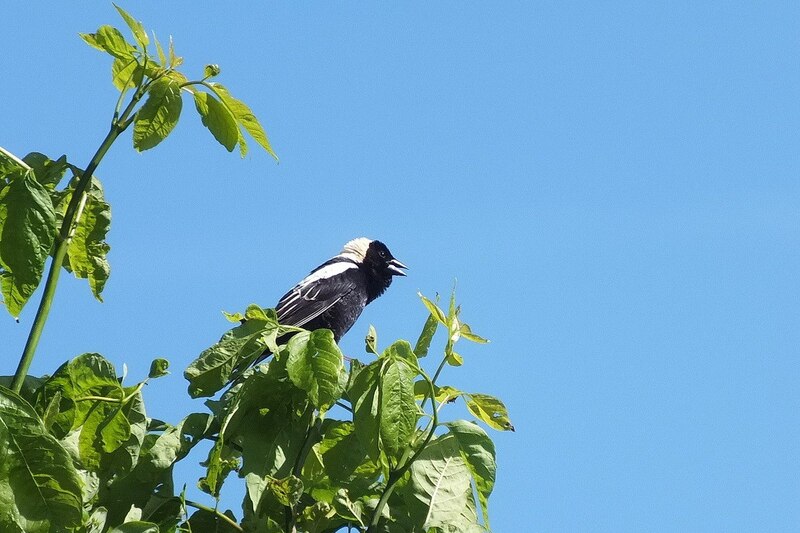 A bobolink (Dolichonyx oryzivorus) in full song was in profile against an azure sky, making for a perfect snapshot. 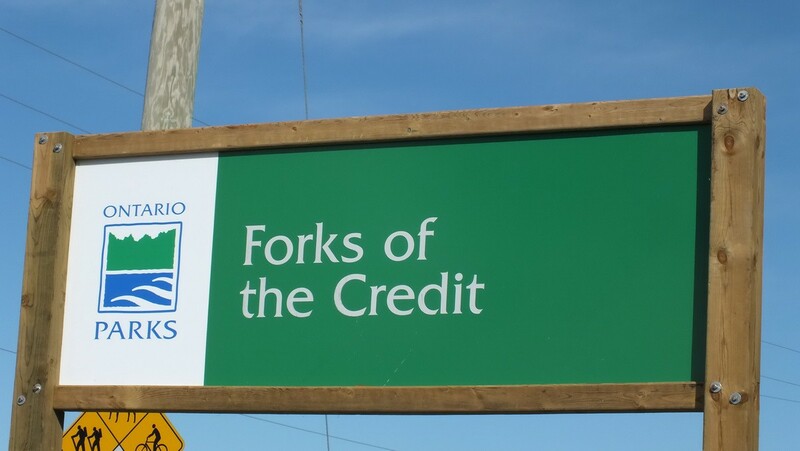 Forks of the Credit Provincial Park near Caledon, Ontario, encompasses a large area that features the exciting Credit River where it narrows and rushes through a deep gorge, culminating in a steep plunge over a precipice before flowing off into the distance. How nice to find that the park is reserved for pedestrians be it walking, hiking, cross-country skiing or snowshoeing. Fishing is also permitted. Over the course of the afternoon, Bob and I explored several of the various trails in the park, and each offered a different atmosphere. 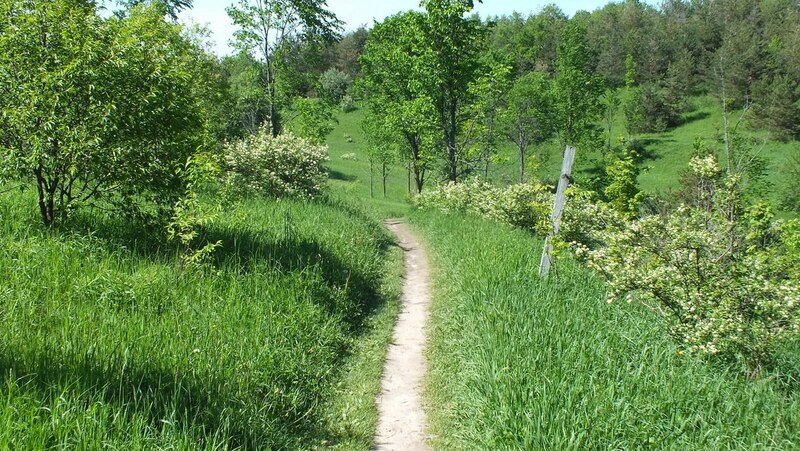 A cow path meandered through a section of the Meadow Trail that led us over rounded hills and through meadows of long, flowing grass. Flowering shrubs leaned on the side of gentle slopes, and butterflies sampled the sweet nectar on wild honeysuckle plants. 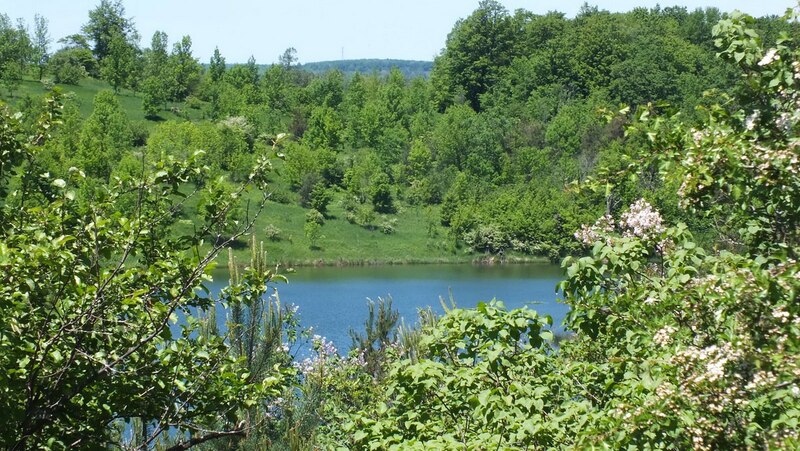 A momentary break in the lush vegetation revealed a glimpse of one of the kettle lakes sitting placidly at the bottom of the hills. 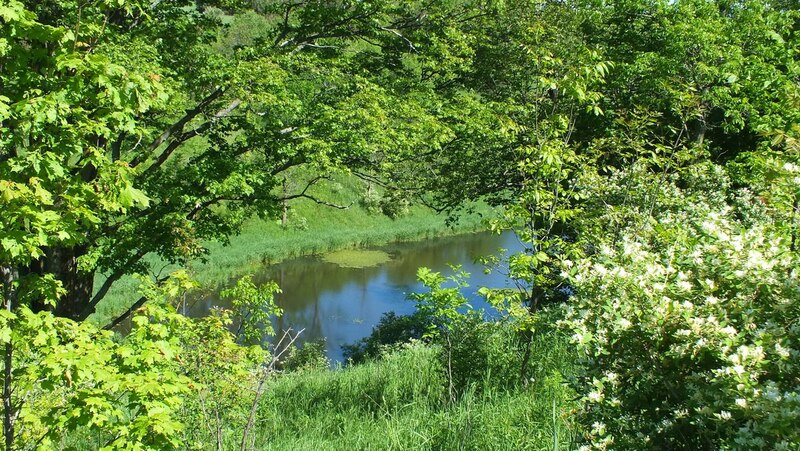 As Bob and I cut across the open hillsides along the Kettle Trail, we were nearly bushed after several hours out in the sun. Our enthusiasm was waning, and the afternoon was drawing to a close. That is when our ears picked up the unfamiliar sounds of another birdsong. 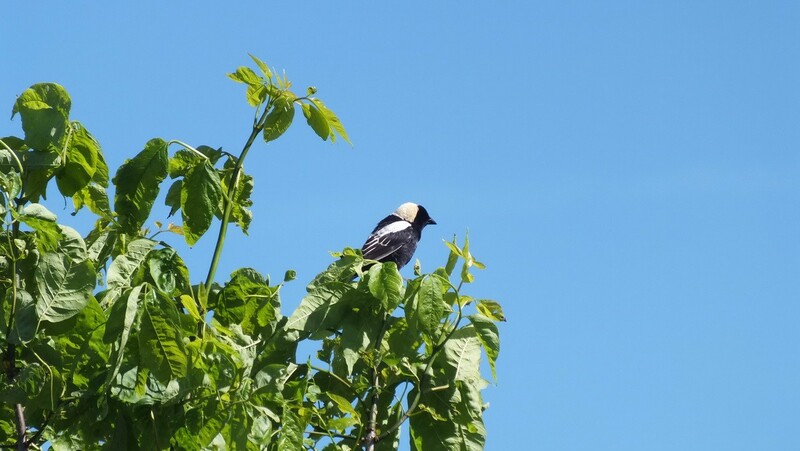 With our senses heightened, we scanned the sea of grass before us and were thrilled to see a Bobolink perched atop a bare branch. The late afternoon sun bathed the hilltops in a brilliant glow as Bob and I stealthily crept closer to the Bobolink, using small shrubs to conceal our movements. We are lucky that Bobolinks select open fields and meadows of tall grass for their breeding habitat as it makes detection that much easier. 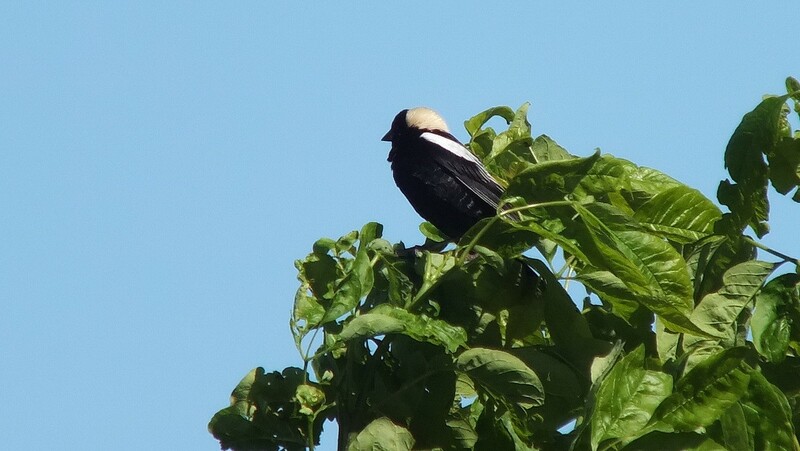 The Bobolink was not content to remain on one perch but constantly moved from tree to tree, all the while singing his merry tune. 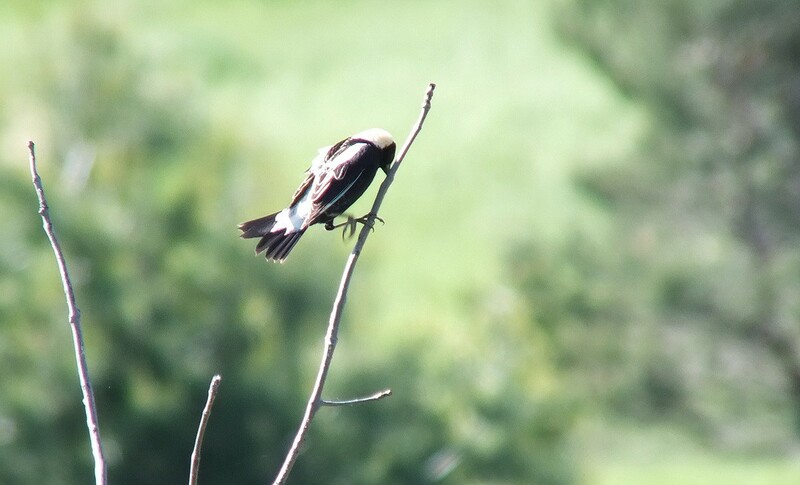 That is when Bob and I realized that there was more than one male Bobolink in the immediate area. Melodious conversations broke out across the distance between the birds as if sharing information about the intruders in their midst. 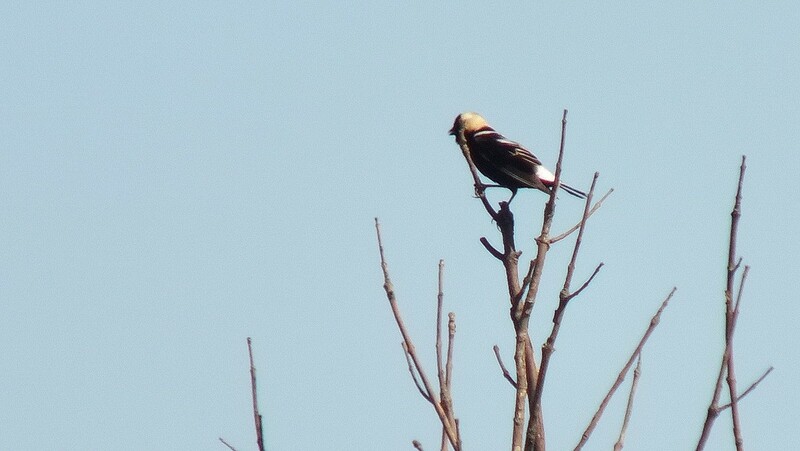 Male Bobolinks have very distinctive breeding plumage. With black underparts, greyish white rump and a pale yellow patch on the back of the neck, they are one of the easiest birds to recognize. This colouring makes the birds stand out when performing showy displays for mating purposes. 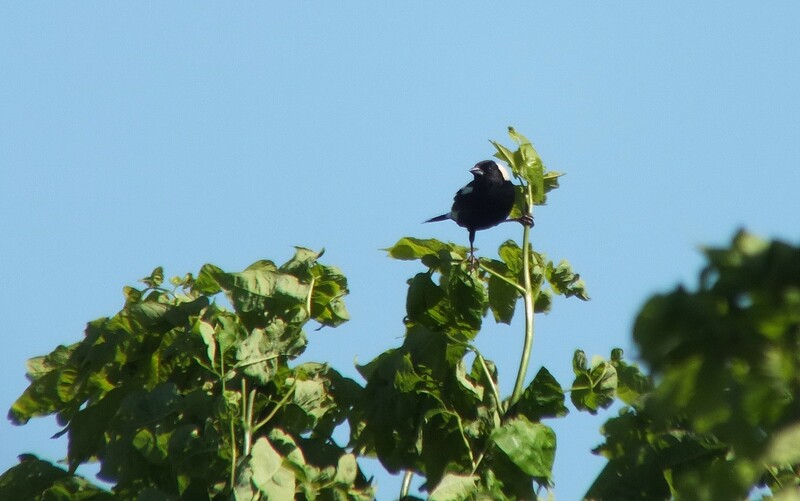 Given that Bobolinks spend much of their time searching for insects and weed seeds on the ground, Bob and I were lucky that any of the birds were in plain sight. At one point, one of the birds did disappear into the long grass at the brink of one of the hills, but whether or not it was feeding is questionable. 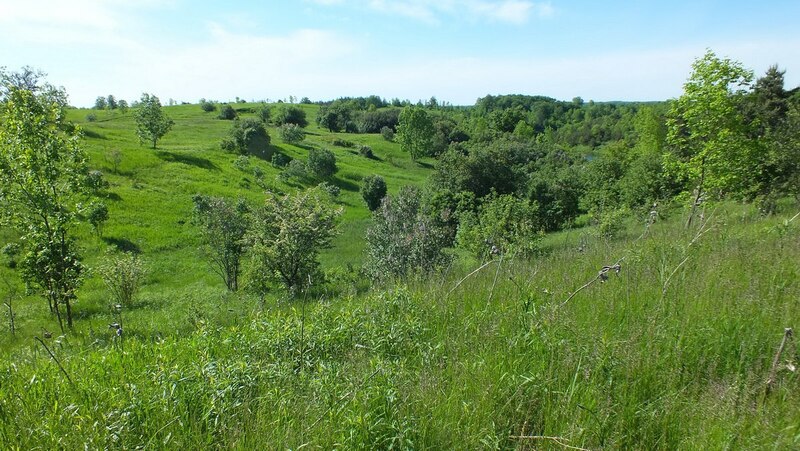 The area was perfect as a nesting site since Bobolinks choose to build their nests on the ground in tall grass or similar vegetation in open areas. 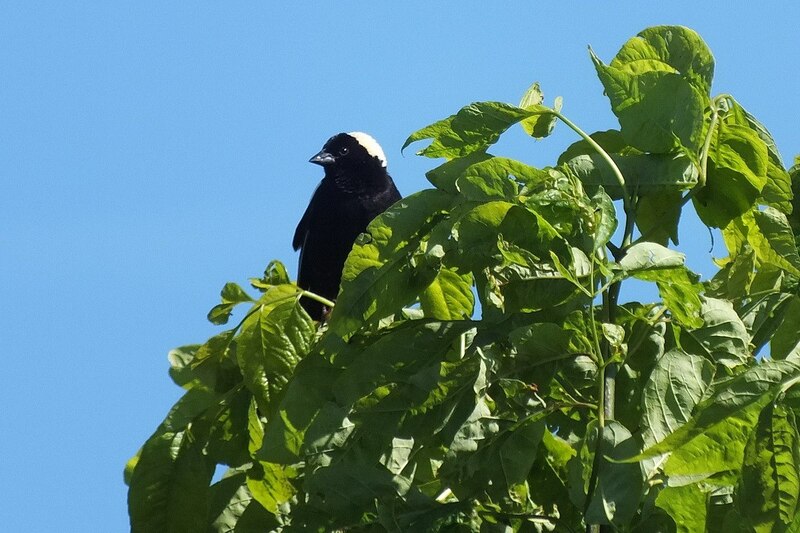 Seeing as the one Bobolink kept to the trees around where it later landed, we presumed that its nest was likely already occupied with the female roosting on her eggs. The fledglings usually appear in June and early July. 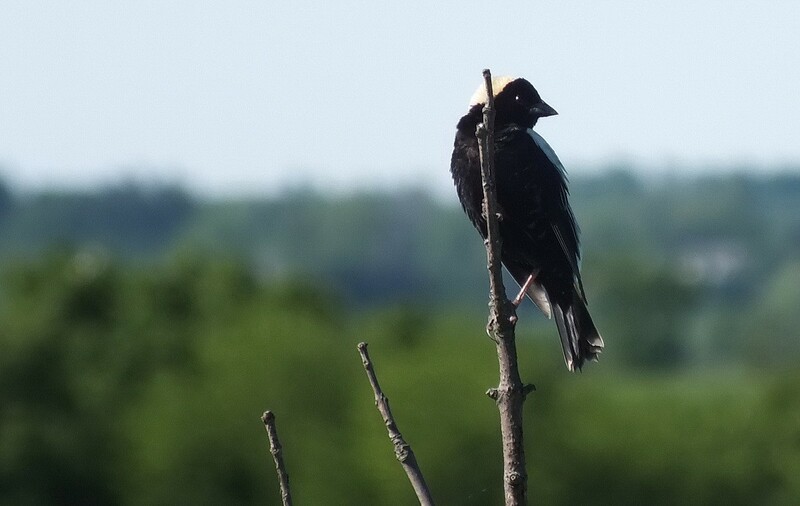 Bobolinks are members of the blackbird family, but once mating season has passed, the male will assume a dull sparrow-like plumage similar to that of the female, and he will retain that colouring for the remainder of the year. We did not see any females that day giving rise to the thinking that they were sitting on the nests. 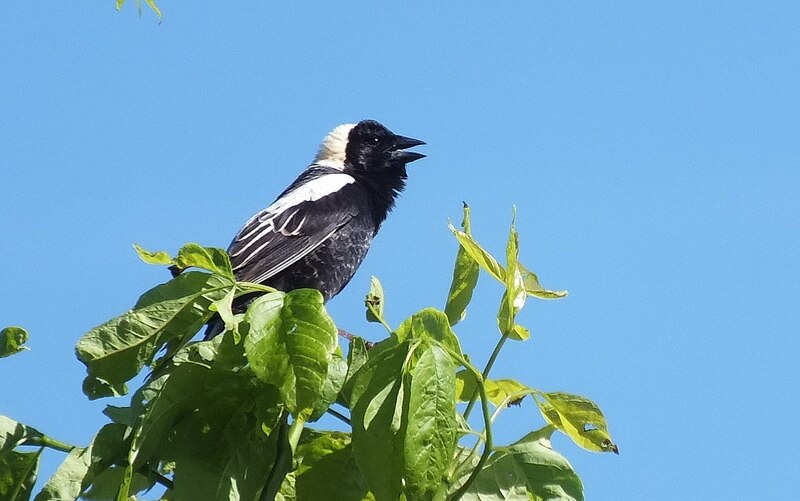 Bobolinks are known for their cheerful song which they sing both when perched and also when in slow flight. The delightful, loud, bubbling performance is made up of short gurgling phrases that are very pleasing to the ear. But after breeding season, the melodic song is heard no more and instead is replaced with a simple metallic “pink”. Towards the end of summer, Bobolinks will rove about in flocks before undertaking their massive migration to Argentina. These birds complete one of the longest annual migrations of any North American songbird with a round trip of almost 20,000 kilometers. That is totally amazing! After dallying on the crest of a kame hill, overlooking Kettle Lake, for more than an hour, Bob and I finally had to bid the Bobolinks adieu. We were bagged and still had an hour’s drive to get home. But we were more than satisfied with our bird sightings on this one occasion and can hardly wait to return to the park in the near future. 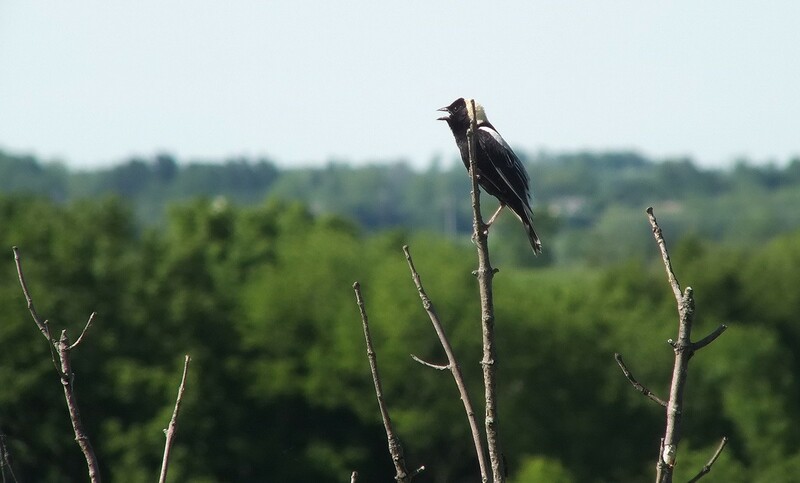 Loved your account of the Bobolink Sighting! Thought you would be interested to know that a 300 acre lot near forks of the credit is a current nesting ground for these endangered birds. Unfortunately there is a proposal to turn it into a gravel pit! This will certainly be detrimental to the survival and repopulation of these beautiful creatures! These are blackbirds, which forage on the ground. They are not dependent on cattails around wetlands, like the red-winged blackbird or yellow-headed blackbird. Bobolinks much more prefer grassy fields.